For the book MAD Dinner, Chen Shuyu and I interviewed Zhang Yimou, China’s most celebrated and successful filmmaker. 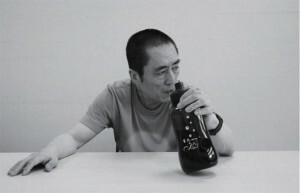 At the time, Zhang was developing his vision for the Beijing Olympic opening ceremony. We talked about challenges to organizing that performance, the pressures of politics on culture in China, and his frustration with his limitations as a filmmaker. Making a film is a similar enterprise to making a building. Both require huge amounts of resources, intensive collaborations, and stability to be realized. And in both cases, the target audience is the public – a population that has no influence over the creation. How do you negotiate the expectations and demands of your films’ stakeholders (studio, producers, investors, government, etc.) while maintaining your original vision? The public has the de facto final word on your work, they are the ones who make the decision. No director will try to deny that. This is especially true in the world of the market economy: the investors don’t want to spend a lot of money for nothing. To be sure, some investments do not expect huge returns, such as money from cultural organizations, charities and whatnot. A director would be able to do anything he wants if he’s mighty enough to attract that kind of funding. But generally speaking, if it’s a commercial product, no matter which genre it belongs to, it strives for profit. And profit comes from the public, who buy tickets and watch your film in the cinema. This is something every director faces. People often think of the public as the opposite of high art, profoundness and deep thinking. They think the kitsch of commercial films is horrible. I have made a couple of commercial movies and I think of the experience as testing the water, you give it a shot and it’s good exercise for you. What’s the point of drawing a line between commercial film or popcorn flick and serious ones? Also, why would a director be considered cheap for making commercial movies and entertaining the public? Who are we then? Are we God? Aren’t we part of the public? To tell you the truth, every time I buy a pile of DVDs back home, I always watch the commercial ones first. I wouldn’t touch the art house titles except for some of the best-known ones, because I know they can serve as sleeping pills just as easily. What good is it to us to put on a sophisticated front and be pretentious anyway? I don’t think one becomes a cheaper director simply by making commercial films, even if the press seems to think so. I think it’s exercise for me. I’m not interested in following the latest fad either, I’m not a young person and it’s pointless trying to be fashionable. The most important thing is to keep elevating oneself, to see if you can make money with your film in this era. If I succeed in that, then I’m going to try to fine-tune my craft as a director. But a movie is too complex to be problem-free, who can brag to be working on a perfect movie? As for the audience’s reaction, well you can’t stop people talking. So it really doesn’t bother me, making movies is simply self-training for me. How has succeeding abroad changed your experience in China? There’s an old saying in China: “The blossom inside the wall is usually appreciated from the outside.” Ever since the Open Door Policy, awards, reviews and reactions from abroad have indeed been influential. The so-called Fifth Generation of Chinese filmmakers got recognized domestically only after making it overseas. And the sixth and seventh generation nowadays are relentlessly trying to replicate that model of gracing their portfolios with foreign awards. I’m not sure how long this is gonna continue to be the case, whether the eighth and ninth generation will still be relying on this model with the same degree of relentlessness. I have no idea. Have you been able to leverage your fame and popularity to gain more control for yourself and others? I suppose we are all aware of the situation in China, which doesn’t exactly allow you to make whatever kind of film you want to in the first place. There are all sorts of restraints, not to mention the system of censorship. As a matter of fact, every director self-censors when deciding on which topic to shoot, as do the investors. There is no absolute freedom; it’s all about the extent of the restraints. Another very important thing is the director’s strategy to balance his artistic integrity against those restraints. Creative works always come with compromise, without exception. So it’s all about balancing, which really refers to the director’s mindset, and how he positions himself against this whole thing of censorship. I think the director can only have limited satisfaction during the process, sometimes it’s even painful, but he has no choice. So do you think there’s no end to that compromise? Or is there a bottom line somewhere? I don’t think there’s a bottom line, unless it’s a front you put on for yourself as a statement or something. How is a bottom line possible? In the end it’s all about how much can you take. To what extent does your personal experience influence your representation of the history and culture in China? I don’t know. I’ve seen all sorts of reviews. Of course, when your film is being screened all over the world and getting a slew of comments and discussions, you don’t exactly have control over the whole situation. Perhaps someone will try to understand a certain culture through your work, but we have the common sense to know that you won’t be able to really understand a culture via art, like you can’t really achieve full understanding of American culture through American movies. So what would you do then? I don’t think that’s a question to which a director would have the answer. I try to regard my work as simple and humble. I have no intention to take any national responsibility; being burdened with such responsibility prevents you from doing things properly. I regard myself as a common director, someone who makes films in the mindset of a common people. Don’t try to change the world with a film. What magnificent trend are you setting? How groundbreaking can you be? These are not the questions that you should ask, they are just press talk. To be sure, a hugely successful movie such as Crouching Tiger, Hidden Dragon does have enormous influence on people all over the world. In fact I think a lot of Chinese art house titles are influential in the world, but only for a small niche. Kung-fu movies are being constantly produced in Hong Kong in the post-Bruce Lee decades, but none of them compares to Crouching Tiger, Hidden Dragon in terms of influence. I’m aware of the fact that the three films I made after Crouching Tiger were influenced by [Ang Lee] and the market he helped create. Ang Lee is a friend of mine, how could it be possible that he was thinking about all these influences during the process of making the film? If my purpose is to be influential, I would have to consciously add or subtract this or that (in the film). It’s too much distraction. Lee’s being influential came afterwards, and that’s not something you can expect beforehand. It’s a principle that the director shouldn’t consider these factors when making the film, instead he should focuses on the film itself. As director of Olympic opening ceremony you seem to have the obligation to juggle many different representations – first a kind of traditional Chinese culture taken from imperial times, then the mass spectacle associated with the communist era, and then a future vision that gives the event a feeling of hopefulness and modernity. How will you balance these different qualities? It is not personal work but team work, and it’s relevant for so many people and their expectations. Just look at all the buzz about it on the Internet or as text messages – there are as many sarcastic remarks as [hopeful] anticipations. It’s indeed impossible to appeal to everybody. Here’s how I look at it: this is doubtless a very, very important presentation, but you still have to stay calm and treat it as it is – it’s still just an entertainment show, and you need to follow the rules and remain sane. Yes, we Chinese think it’s a centuries-old dream come true, so we have to grab the chance and comb through our 5000-year history, but in the end it’s nothing but a one-hour show. No matter how great you are, it’s not possible to tell a 5000-year story in one hour. What you want to do is to present the story in visual, aesthetic, and emotional terms. It would be ridiculous to expect anything more than a show from it simply because of the unprecedented anticipation. I mean, why don’t you just write an editorial piece instead of producing a show then? So I think I have a proper attitude towards it, and I won’t be bothered with all of that. I know it won’t be perfect, but the most important thing is to be entertaining and innovative – we also want to have general appeal. We need to have a universal, humane perspective, which is able to strike a chord in, say, an 18-year-old African youth’s mind. He who knows nothing about China should be able to say: I seem to know a little bit of the Chinese elements now. These are all important. When facing such a complicated creative project, I think it helps to start by simplifying things. Steven Spielberg is a consultant for the open ceremony. He has made a large variety of films, including films about the future. So far you have directed a lot of movies about Chinese history and contemporary life, do you have any interest in imagining the future? Spielberg is my good friend, he’s also the most adaptive filmmaker in the world, because he is the most influential one in the trade. Personally speaking, I’m pretty optimistic about the future, because I have witnessed the shocking speed of China’s development – despite the negative and positive comments and all the turmoil you can’t dodge. Nevertheless, I still think our vision, knowledge and thinking patterns have well improved compared to the pre-1976 era that we experienced. So we should embrace the current development, because I think we all have a vested interest in it, every one of us. I would say I’m equally optimistic with my work. To say the least, I hope that the censorship can be looser and directors can be granted more creative freedom before I get too old to make films. What is your greatest frustration? My own ability. We all know the saying about creating things: vision is useless without realization. Our life and creative experiences broaden our vision, and they help us make accurate judgments. When creating stuff ourselves, however, we constantly suffer from the lack of ability to realize that vision, and too often end up wanting to kill ourselves. I think this is an eternal situation for me. The best work is always the one inside your head, to realize it is to hurt it, how annoying! Your craft is just never good enough. I’m competing with myself here, or shall I say with my creative energy. No, I’m by no means satisfied. As a director, do you pay attention to the new architecture in the city? How would you evaluate its effect on our lives? I have the feeling that the architecture in this city has never had a comprehensive, overall planning scheme; it was carried out by a kind of guerilla strategy, a little bit of this here and a little bit of that there. Ever since the establishment of New China, there have always been a lot of make-do measures, so this is the larger background. Today, the urban landscape is still pretty much a mess, and there’s no quick fix for it, because every government official just wants to perform well and score a point or two in his or her tenure. What shall we do then? I have no idea. I guess this is the reality of Beijing and the remnants of a long historical era. No matter what the architectural theorists and critics say, no matter how desperately we are trying to rescue the declining contemporary architectural culture, this is the reality we have now; it’s a phase in our history that we must confront. It’s our past and now, and you have to deal with it. What does Beijing look like? It looks just like that.